Executives In Fukushima Nuclear Disaster Deserve 5-Year Prison Terms, Prosecutors Say Japanese prosecutors say three top TEPCO executives didn't do enough to protect the nuclear plant, despite being told in 2002 that the Fukushima facility was vulnerable to a tsunami. 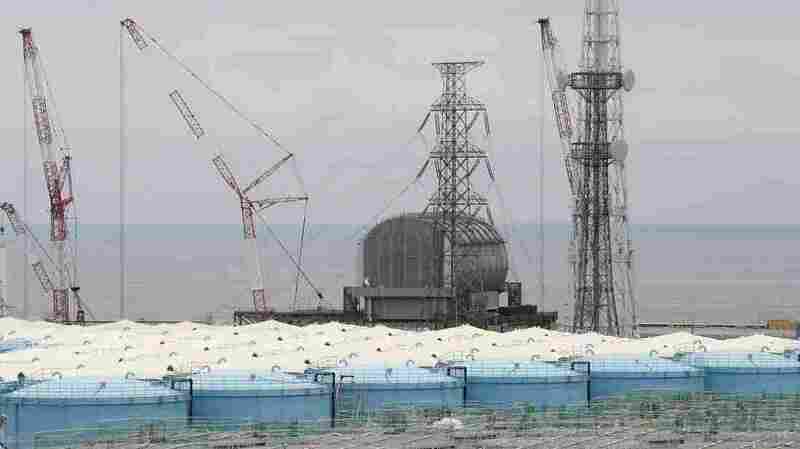 Prosecutors say TEPCO leaders should have known the risks a tsunami could pose to the Fukushima Dai-ichi nuclear power plant, which sits along Japan's eastern coast. Here, the Unit 3 reactor is seen this past summer, amid storage tanks of radiation-contaminated water. "It was easy to safeguard the plant against tsunami, but they kept operating the plant heedlessly," prosecutors said on Wednesday, according to The Asahi Shimbun. "That led to the deaths of many people." Former TEPCO Chairman Tsunehisa Katsumata, 78; former Vice President Ichiro Takekuro, 72; and former Vice President Sakae Muto, 68, face charges of professional negligence resulting in death and injury. Muto and Takekuro once led the utility's nuclear division. All three have pleaded not guilty in Tokyo District Court, saying they could not have predicted the tsunami. The stricken plant triggered mandatory evacuations for thousands of people. Prosecutors link 44 deaths to the incident, including a number of hospital patients who were forced to leave their facilities. The next step in the case will see a lawyer for victims and their families speak in court on Thursday. But it won't be until March of 2019 that defense lawyers will deliver their closing arguments, according to Japan's NHK News. Hinting at what the defense's argument might be, NHK cites the prosecutors saying, "the former executives later claimed that they had not been informed, and that the executives put all the blame on their subordinates." The case has taken a twisting journey to arrive at this point. In two instances, public prosecutors opted not to seek indictments against the three TEPCO executives. But an independent citizen's panel disagreed, and in early 2016, prosecutors in the case — all court-appointed lawyers — secured indictments against the three former TEPCO leaders. All told, around 19,000 people are estimated to have died in eastern Japan's triple disaster that included a powerful earthquake off the coast of Tohoku, a devastating tsunami, and the worst nuclear meltdown since the Chernobyl catastrophe of 1986. In September, Japan's government announced the first death due to radiation that was released at the Fukushima plant.